Baker Melanie Hogan’s romantic holiday plans with her workaholic boyfriend go awry when a chance meeting with a mysterious Santa strands her and her boyfriend’s best friend Dean in a charming small town. There, Melanie finds her lost Christmas spirit and starts to see that the man of her dreams may not be her boyfriend after all. when will it be out on dvd? My daughter and I love this movie as well as all the Hallmark Christmas movies. We couldn’t wait for Halloween when they said the Christmas count down started on Halloween. Thank you Hallmark for the wonderful movies and for giving us something different to watch then the usual TV lineups. For a short period of time..we get to live life thru these movies and smile. This is the first Christmas without my precious mother so watching these gives my daughter and I a little something to look forward to. I hope soon you will release this movie as well as Hats off to Christmas and several others on DVD. I hope Jan 4 arrives slowly..I scan the TV every morning so I can see when my favorites will be on. Love this movie, would like to see a sequel to this as well. When is this coming out for 2015? I LOVE this movie. The best line is “Do I fit?” Santa is absolutely charming and well cast. The original boyfriend may not be a liar or evil but is thoughtless. He thinks they have been dating for several months when it was stated that it had been more than a year. It is great that the original boyfriend also finds love. Why does anyone need to be a loser? Everyone lives happily ever after! This is the PERFECT feel good movie. Absolutely love this movie! Like everyone else …. am praying it will be on again this year and soon to come out on DVD. Would love to have this to watch whenever the mood strikes! Love ALL the Hallmark Christmas movies and look forward to the ‘Countdown to Christmas’ every year. Thank you Hallmark for taking time out for your hopeless romantics!! we love Christmas! 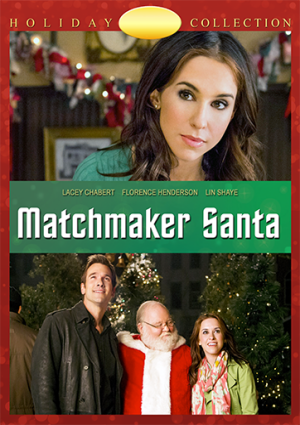 MATCHMAKER SANTA AND HELP FOR THE HOLIDAYS ARE TWO MOVIES I HOPE YOU RELEASE SOON ON DVD. THEY ARE REALLY FANTASTIC MOVIES AND I WOULD LOVE TO HAVE THEM IN MY CHRISTMAS MOVIE COLLECTION. I love this movie. The characters are funny and I happen to love the story line. Santa didn’t lie, Santa just knew that the original couple were all wrong for each other. Obviously anonymous takes things alittle to seriously. This is a fun/romantic, feel good Christmas movie. And buh humbug to anonymous. Love the movie, one of my holiday favorites. Also hope it will be available on DVD soon. That green coat that Lacey Chabert wears in the movie is adorable. Where is one like it available? Does anyone know when this will come out?? I really want this movie. I totally agree with most of you. It’s a feel good movie and I absolutely love it. Hallmark please bring this on DVD!! Love the cast, but the story line is awful. It makes Santa manipulative and deceitful. The only way the two characters are falling in love is because Santa changes what may have happened with the original couple. He is also making the original boyfriend out to be a lire in the girlfriends’ eyes and the co-worker/friends eyes. And then to put the two characters in the Honeymoon Suite – when they aren’t a married, let a lone a couple. Lighten up. Santa is trying to help 2 people find true LOVE. As for the room the story line states why they were placed in the HONEYMOON suite because It was the ONLY room left the Hotel. And they did not sleep together. This movie is cute, light and heart warming. And the boyfriend was not made out a lire. He was made out to work to hard and found love with his old girlfriend. And he made the BEST Santa very. Cannot wait to watch this movie again. And I cannot wait until they release this on DVD. I will be buying this movie. Thank you Hallmark movie channel.